If, like me, you are a keen knitter or crocheter you will probably have balked at the price of yarn, especially real wool, cotton or bamboo. 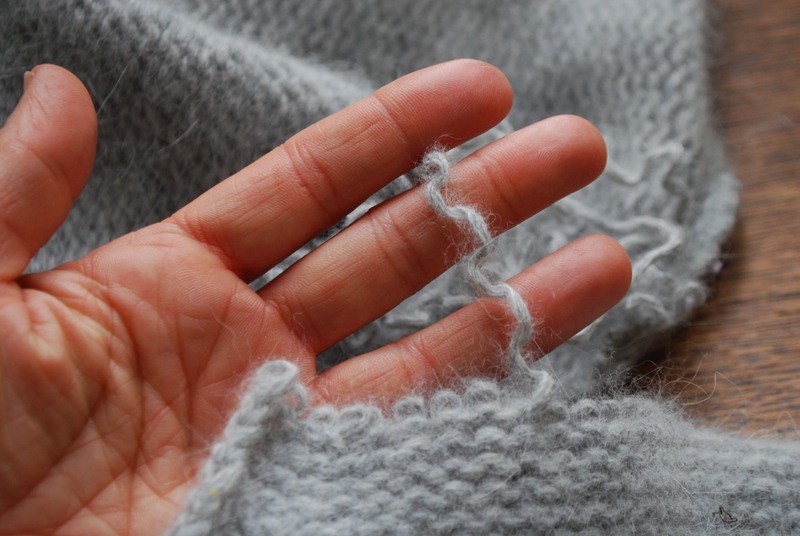 The sad reality is that it is much cheaper to buy a jumper than it is to make one and you get none of the pleasure and beauty of a handmade garment. Unravelling a charity shop or boot sale jumper can save you a considerable amount of money and is also making good use of available, recycled materials. This jumper cost £1 from a car boot sale; it is a snuggly wool/mohair blend. The pattern will mean that I will have some wastage but this still a good candidate for unravelling. I do have pangs of guilt about unravelling wearable garments but I also love making things and don’t want to buy expensive, energy intensive virgin materials. Check the seams – You want a jumper that has Good Seams. This is a Good Seam. It has been made by joining two knitted edges with a crocheted or hand sewn seam. This is a Bad Seam. It is has been made from a large piece of knitted fabric, cut into pieces and sewn together. If you try to unravel this you will end up with loads of short lengths of yarn. Don’t bother. Don’t despair though if your jumper has Bad Seams. 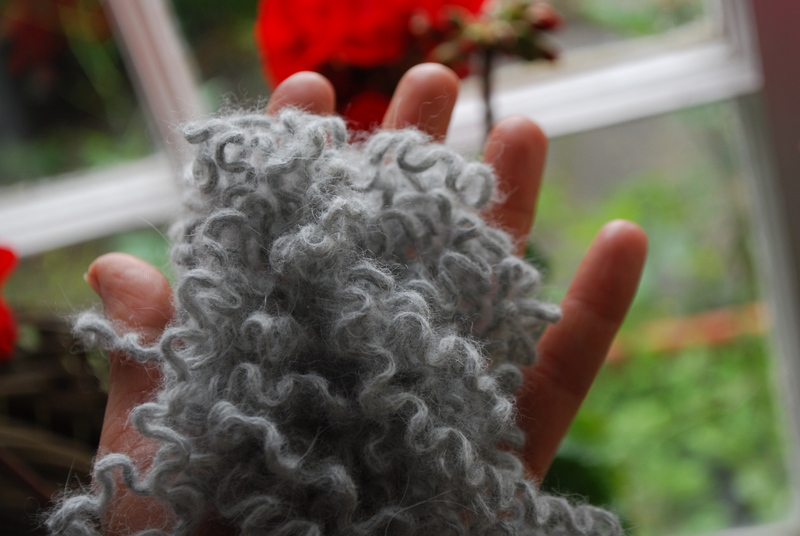 It can be felted in the washing machine and sewn into sturdy bags, cushion covers etc. Sometimes you will be caught out with a Bad Seam somewhere in your jumper where you didn’t expect it, usually on the shoulders! Don’t worry, you might waste a bit of yarn but it can still be unravelled. Remove all buttons, zips and labels – make sure you unpick all the threads because they can make your life difficult later on. 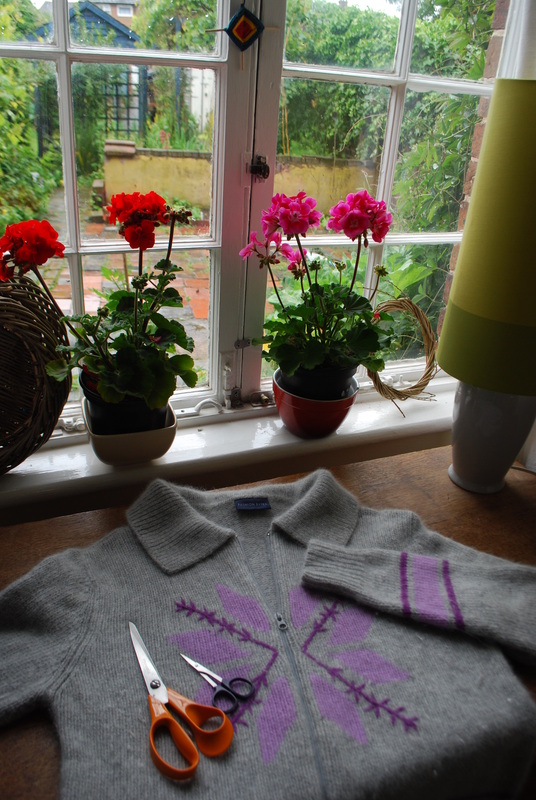 On the jumper I have chosen I also had to unpick the deeper purple pattern but as it was hand-sewn it came out easily. this picture shows a different jumper but is it conveniently joined in a different colour so you can easily see the stitches. 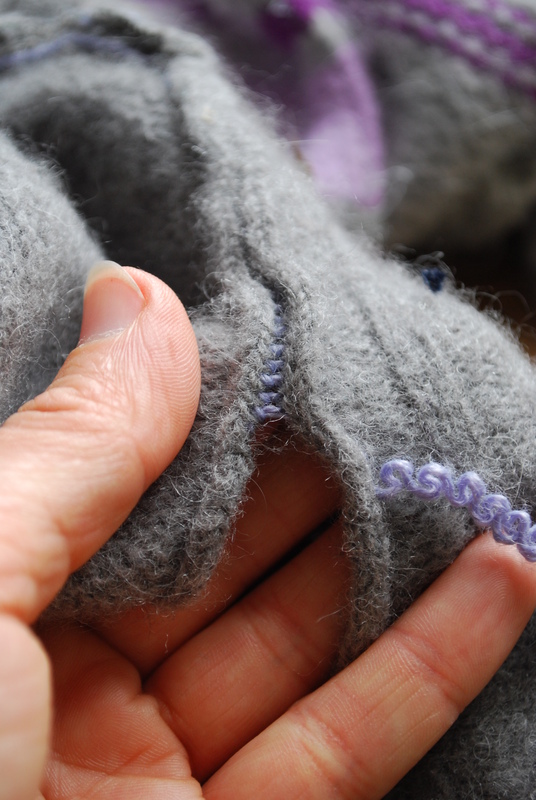 To undo this stitching start from the loop end (right to left in this picture), cut the thread, pull through to the back and it should unravel obligingly and quickly! It takes some practice but it is worth persevering because otherwise you have to snip all the threads making it much more time consuming and increasing the chance of snipping through the yarn you are trying to salvage. If you pull apart the seam you can see the joining thread and the loose end to pull. At this point you can choose to snip the threads if it is proving difficult to pull out the stitches. 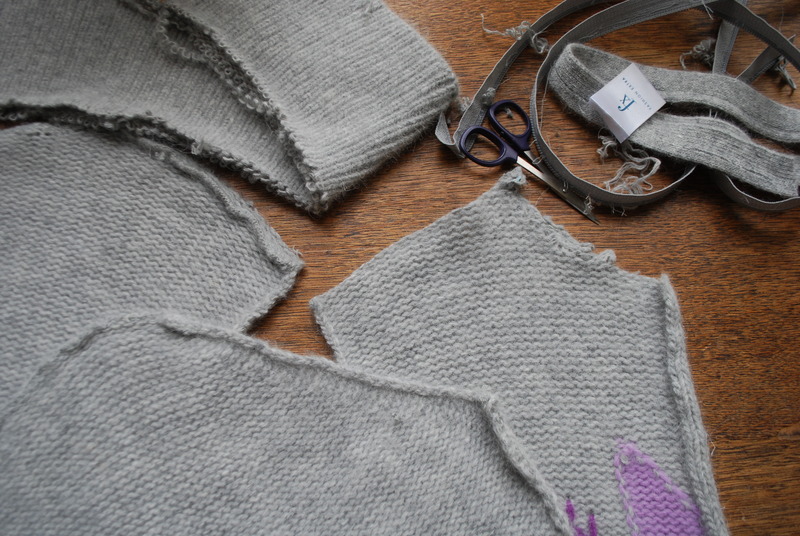 Start taking apart the jumper – you can do this any way you like but I usually start with the side seams then the sleeves and the collar. In this jumper I found Bad Seams at the shoulders so I just snipped them off which will waste a bit but can’t be helped. 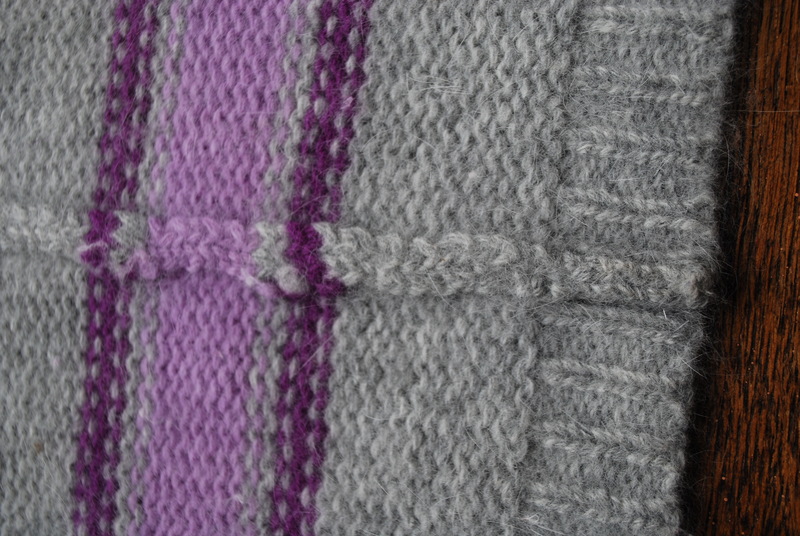 The purple stripes in this jumper were just knotted on to the grey so when I got to these I just snipped them and rejoined the grey with a knot. Start unravelling –the fun bit! This is the sleeve. Start at the shoulder and find the end of the yarn. You might have to make a snip but it should make itself clear. 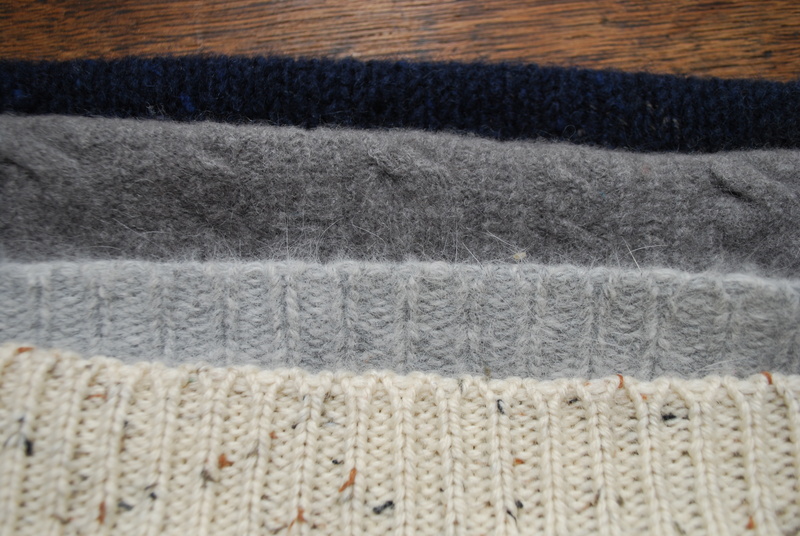 Most jumpers are knitted from bottom to top and to unravel you go backwards (top to bottom). If you are struggling to unravel turn it around and try the other end. Your yarn will look like this. Wind it into a ball as you go to stop it getting tangled. Don’t wind your ball too tight as you will stretch the wool and it will lose its ‘give’. At this stage some people wash and hang their wool in skeins to get all the kinks out. I personally think that this is too much of a palaver and I just want to get on with making something. The kinks do relax and the results in the finished article are good enough for me. 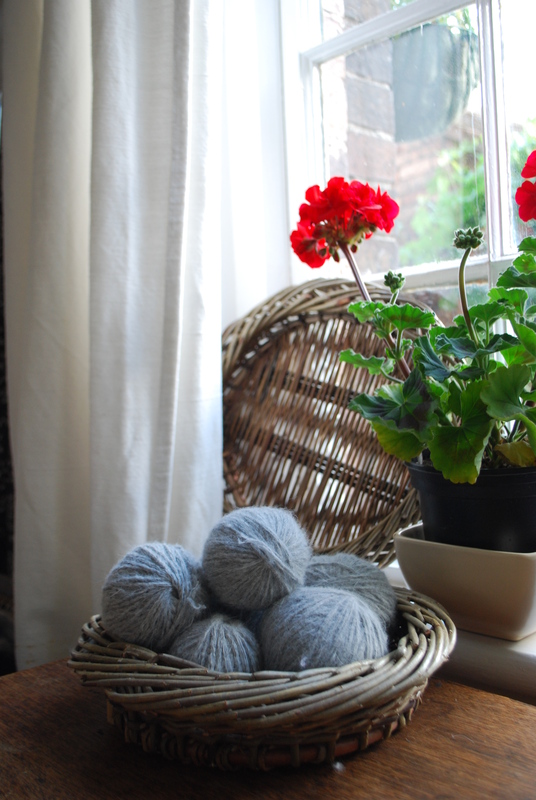 If you are planning to store your balls of yarn for some time it may be worth using a wool winder which winds balls loosely and again prevents the yarn from losing its elasticity. 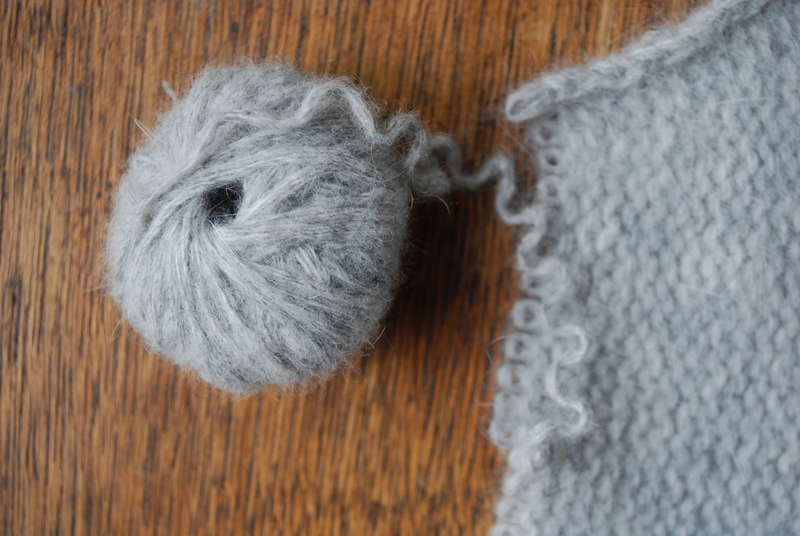 With a wool winder you can also make balls that don’t roll about on the floor when you are knitting up your garment. I solve this by putting my balls in a heavy jar on the floor next to me: simple and time saving! My balls of wool ready for my next project. In total I have salvaged 350g of yarn. 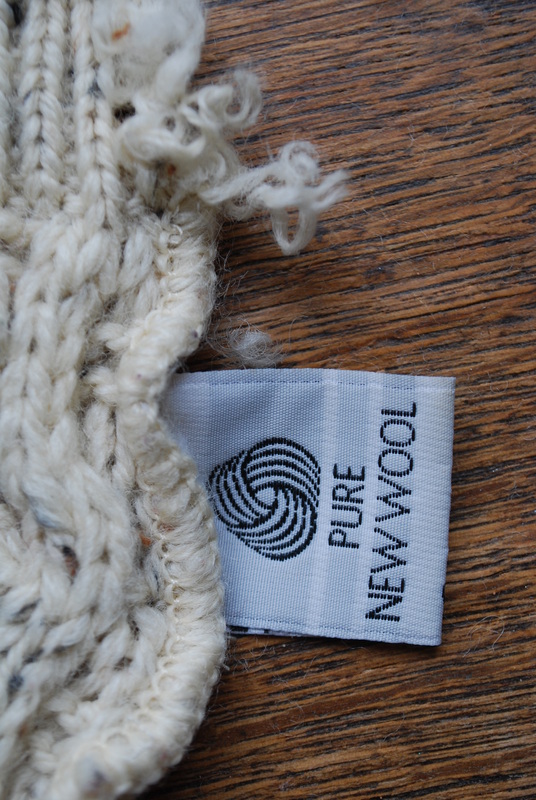 With good quality yarn retailing at around £4-£8 per 50g I have saved £27-£55 and avoided the energy, land use, water and toxins associated with manufacturing new wool. It is also a treat to have some mohair because I would never buy it new due to animal welfare issues. Time to get to work on my project!